Shalom, chaverim! It's been a couple of weeks since I've posted, and I have no excuse for my radio silence except for the usual double-whammy of being either too busy or too exhausted to write, and sometimes both simultaneously. The funny thing about working several bazillion jobs (at last count) is that one's time very quickly becomes spent only in three ways: preparing for work, doing the work itself, and recovering from work. When my life gets like that, my observational blinders go on, and I find myself noticing very little about my surroundings, and lose that sense of wondrous excitement that I had when there was more temporal (and mental) "space" to appreciate my environment. Spring is on its way, but it took a friend to point out that the cherry trees are just about ready to blossom, and the fields are full of poppies and other wildflowers. Likewise, Mr. and Mrs. Bird, a relatively monogamous pair of sparrows who nest in our neighbor's overflow drain, have begun trying to make more Little Birds. With great enthusiasm, I might add. Still, I've had a little bit of a rest these past days because in Israel, Purim is a two-day school holiday. And this year, unlike last year, I didn't crap out and fail to attend a giant Purim party. 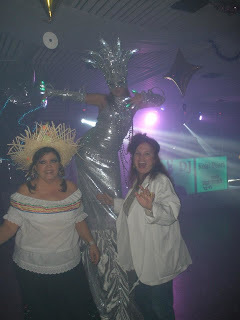 Elul and I went to the kibbutz at Rosh Ha'Nikra, where they hold one of the biggest Purim parties of the year. The cost was 90 NIS per person (about USD $22.50), and featured an open bar, food, decorations, and a very good DJ, complete with lights, fog machine, disco ball and even a couple of dancing girls with multiple costume changes. The DJ had a great mix of music, and it was wonderful to see hundreds of people, all in costume, just shaking it out there on the dance floor. Especially when we were dancing to Abba tunes! Dancing Queens, indeed. Note the smoky atmosphere, NOT coming from my fake cigarette. My costume was not particularly funny or outrageous, but it still meant something to me. 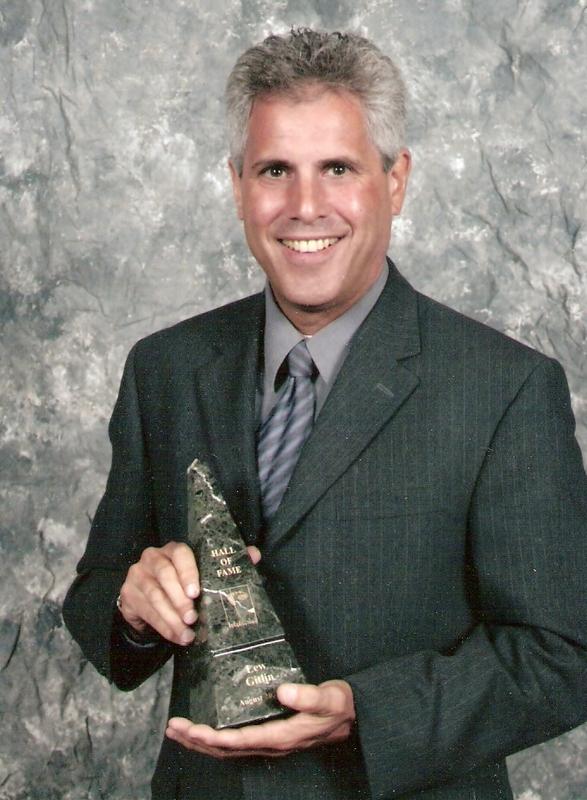 My father, who passed away just three years ago, was a doctor with a great sense of humor. He loved costume parties, and always served as the master of ceremonies at his clinic's annual Halloween party. My stepmother was kind enough to give me one of his old lab coats after he died, so I decided to wear it to take a little "part" of him to the party with me. My costume was as a Russian-Israeli doctor who worked for an Israeli health fund, complete with dark circles under my eyes, long hair falling all over the place, bluejeans, lab coat, sparkly top, and a (fake!) cigarette in my hand. "Subtle" is what I was going for, although others could have just as easily tagged my costume as "lazy" or "weak." Never mind--I was wearing comfortable clothes and I was doing something in honor of my dad, and that was the only way I was going to go. Other friends of ours were much more imaginative and colorful with their costumes. My friend Angie (above) is a Colombian-American-Israeli, and she went to great lengths to construct an enormous Carmen Miranda-style hat, with a pile of fake fruit glued on top. Handily, she can also use that hat as a centerpiece for next year's Thanksgiving. Her fiance Simon went as a "gorilla fighter" (geddit? ), complete with a toy machine gun, a banana, and a card on his t-shirt that had "gorilla fighter" written out phonetically in Hebrew. Lisa and Jonatan also picked up on the Latin theme, and went as citizens from somewhere south of the U.S. border. Carlos went as the famous, masked, "Blue Demon" Mexican wrestler. 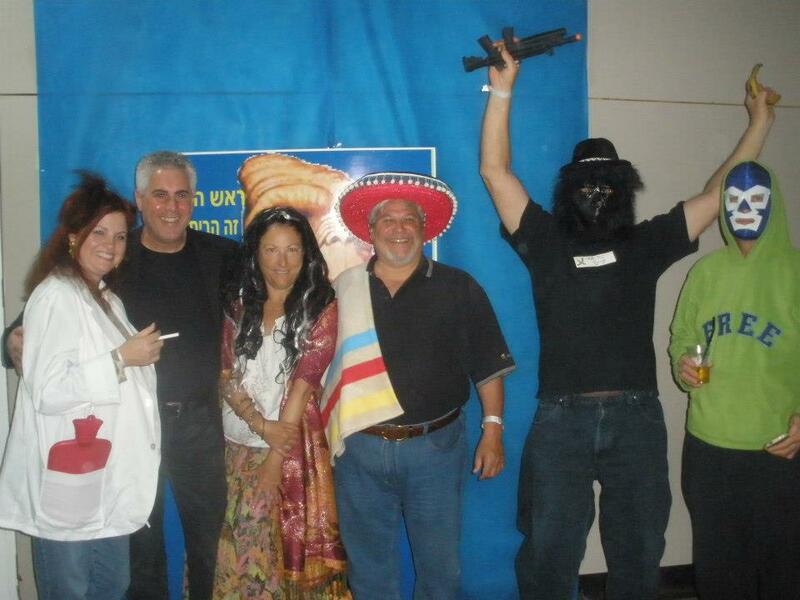 Left to right: Yours truly, Elul, Lisa, Jonatan, Simon the "gorilla fighter," and Carlos the "Blue Demon." Behind Lisa's head is a rendition of E.T. Elul went as Yair Lapid, the leader of the Israeli "Yesh Atid" ("There is a Future") political party, with which Benjamin Netanyahu may be trying to form a coalition. Since Elul resembles Lapid quite a bit, his costume was a simple matter of dressing the way Lapid usually dresses (black t-shirt, black blazer, black jeans) and touching up his eyebrows with an eyebrow pencil to make them a bit bushier. To his credit, a few customers did a double-take in the grocery store, perhaps wondering if he was, indeed, Lapid. 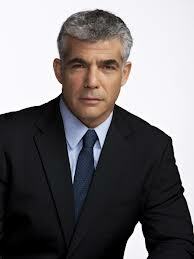 Hottie Israeli politico Yair Lapid--thanks to Tikkun.org for this image. My hubby is hotter, though. So, we have lived to tell the tale of our first blow-out Purim party in Israel. It's hard to believe this is actually our second Purim in Israel...at this time last year, we were so dazed and out of it from being so new here, we really didn't know how big a deal Purim was. This year, we were too busy and tired to do much about it. I've had to turn down four other Purim party invitations because of work, in fact, but next year I'll know better and will clear my dance card in plenty of time. And I'll put some real effort into getting a great costume together! Shalom, chaverim! While the northeastern states in America get their collective tucchuses clobbered by the Mother of All Blizzards, we've been ambling along in mostly sunny Nahariya with only a few days of rain. I never thought I'd be using the words "balmy" and "February" in the same sentence, but here it is: truth is stranger than fiction. We had some good news earlier in the week: Elul got a new job! He starts bright and early next Sunday, and this time it's working for a successful and established online business that sells information and support services to the public. In other words, it's not a startup, which is a good thing. The job will make good use of his many talents in marketing, journalism and business management, and will be a great source of free Hebrew "immersion classes" (read: sink or swim in the office). For the lead on the job, we are once again extremely grateful to the amazing and wonderful Tamara Klinger-Levy, the employment coordinator for the Go North program of Nefesh B'Nefesh. Tamara truly works tirelessly to help olim find jobs and navigate their way through the Israeli work climate, and has helped us and a number of our friends find work here, which is vital for making your Aliyah a successful one. In other news, I've been doing my first paid gigs singing at a retirement home just around the corner from us. While I had the idea to do these types of shows the minute I arrived, it took quite awhile to get my repertoire together, buy a good Shure SM58 microphone, and for our wedding anniversary to come around so Elul could give me the gift of a badly-needed sound system. Fortunately, it all came together and I made my debut a couple of weeks ago at the "Yarden" rest home in Nahariya. I was commissioned to do three one-hour performances, which luckily are scheduled in the tiny block of time I have on Sundays between teaching and choir practice. I've done two already and have one left. The audience is extremely supportive and forgiving of my bad Hebrew that I use to fill between songs, but they are getting more than a little tired of me mainly doing songs in English and keep clamoring for more Israeli and Yiddish songs. Thanks to the internet and YouTube, this week Elul and I have managed to scrounge up backing tracks for the most popular tunes like "My Yiddishe Mameh," "Tumbalalaika," and "Bay Mir Bistu Sheyn." I will be working on extending my repertoire as time goes on, but I realize that as a musician, I sorely lack the canon of knowledge that comprises Israeli, but not necessarily Jewish/liturgical, popular music. I clearly need an "informant" who can help me put together a show-stopping set list that will ensure lots of repeat business. Speaking of show-stoppers, as we were scouring the web for Yiddish music, Elul came across this gem of a Purim takeoff of "Moves Like Jagger," called "Move Like Graggers." (A "gragger" is a noisemaker used at Purim.) Not only is it an amazingly clever and funny piece of work, but I was proud to see it was created by the rabbis and cantorial soloists of Temple Israel in West Bloomfield, Michigan, where I first got involved in performing Jewish sacred music in the (gulp) late 1980's. Rock on, Temple Israel! Shavua tov, chaverim! Well, our little corner of the world seems to be hotting up once again, this time with Israel carrying out two separate air strikes in Syria this past week. Some of the facts are disputed, of course, and the Israeli government is basically giving the world a big, fat, "no comment" about it all, but still, it's a bit worrying. In Nahariya, we heard loud military aircraft buzzing around the border at all hours of the night for nearly a week, although it seems to have calmed down now. On a humanitarian level, what's been happening in Syria is absolutely dreadful. The weather here has been cold and rainy for a few weeks now, and it is certain that tens of thousands of refugees, who are mainly urbanites, have been living in tents in various refugee camps in Jordan, Lebanon and Turkey. Some have been moved into temporary, substandard housing, and others have been dispersed throughout different communities to live in crowded and noisy conditions. Elul and I lay warm in our beds, with hot running water, plenty of food, jobs to go to and courses to attend, while hundreds of thousands of our neighbors languish in camps, grieve for their dead, and watch their dreams for their children's education, not to mention their future, literally disappear in a puff of smoke. No matter which way you look at it, the staggering death toll within Syria itself, the continual destruction of housing, industry and infrastructure, and the enormous disintegration of mass centers of the Syrian population, all lead to a chaotic and quite bleak picture for every citizen there. It is frustrating for me to watch the daily news, where every day I see yet another bunch of politicians, diplomats, envoys and representatives all roll up in yet another bunch of shiny black cars, to sit around another big, shiny conference table, in yet another luxurious hotel, only to hear, yet again, that nothing worth a fig has been accomplished. No peace, no working ceasefires, no resolution. No end to the bombings, the imprisonments, or the slaughters. Since Israel and Syria have not exactly been kissing cousins for quite some time, I honestly don't know if the Israeli Magen David Adom (like the Red Cross, without the cross) is directly involved in humanitarian relief efforts for Syrian refugees. I'm fairly certain that none of the refugees are staying within Israel, however. Still, wherever you are, if you have a few bucks lying around, or even if you want to skip an appetizer and a dessert when you go out for dinner next time to save the money, please consider donating to a reputable charitable organization that can provide humanitarian relief for them. There is no one in their right mind who would actually want to make being a refugee a "lifestyle choice," so let's do what we can, even if it is simply praying for peace worldwide and helping good causes however we can. Israel cannot afford to be living cheek-to-jowl with a country that has squandered its most precious asset: their own people.